Ryan Lochte is an American competitive swimmer and 12-time Olympic medalist. He has won six Olympic gold medals. Lochte is the second most decorated male swimmer in Olympic history. He has set world records in several events such as the 100 meter individual medley and the 200 meter individual medley. 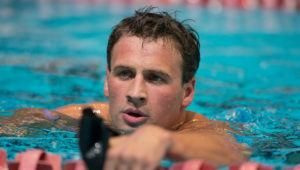 Born Ryan Steven Lochte on August 3, 1984 in Rochester, New York, to parents Steven and Ileane “Ike” Lochte, he has two older sisters, Megan and Kristin, and two younger brothers, Brandon and Devon. He is of Dutch, English, and German descent on his father’s side, and of Cuban descent on his mother’s side. On October 9, 2016, he got engaged to model Kayla Rae Reid and married on January 9, 2018. Together they have one son, Caiden Zane. *He was born on August 3, 1984 in Rochester, New York, USA. *He started swimming at age five. *Coached by his father, Steven R. Lochte. *He has won 12 Olympic medals, including 6 gold, 3 silver and 3 bronze. *He won a gold medal in the 4×200 free relay and a silver medal in the 200 IM at the Athens Olympics. *He was named Swimming World Magazine’s World Swimmer of the Year in both 2010 and 2011. *He helped the U.S. team win gold in the men’s 4×200 freestyle relay in 2016. *He idolized Pablo Morales who is a gold medal holder at the 1992 Barcelona Olympic Games. *He enjoys skateboarding, basketball and surfing. *He’s a huge fan of rap music, and Lil’ Wayne is his favorite singer. *He good friends with fellow US swimmer Michael Phelps.